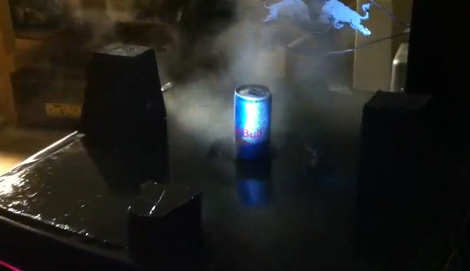 The Eugene Maker Space’s entry in the Red Bull Creation contest dispenses cans in a mysterious fog through an iris opening. But it’s also capable of disposing of the Red Bull cans… and only those cans. If you try to put a different soda in it will violently reject it! First off we must applaud the Eugene Makers for their prolific documentation of the project. There’s a day or two worth of fun reading/watching on that page so make sure you save the bookmark (and learn from their example!). Inside the mysterious waist-high enclosure there’s a hopper to store the energy-drink reservoir. As a can is dispensed its barcode is scanned to ensure this is an approved beverage. At this point the can is elevated through an iris in the case of the enclosure, al0ng with a theatrically timed puff of fog. The parts of the iris were printed on paper and used to cut out wooden pieces using a scroll saw. The fog blast is from an inverted duster can with a 3d printed nozzle that helps make it Bullduino controlled. When done with your beverage the can can be placed back in the opening, where it is again scanned before going into the recycling bin. But as you can see in the clip after the break, trying to sneak a soda can into the machine will launch the empty right back at you! 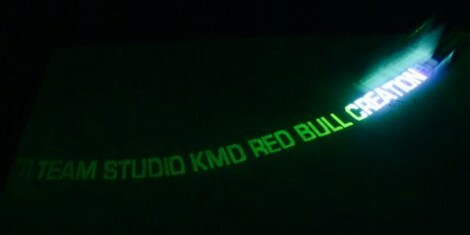 This entry in the Red Bull Creation contest uses a laser to charge up a glow-in-the-dark message board. The concept is something we’ve seen several times before. Since light can excite a phosphorescent surface, moving pixels of light over that surface leaves a fading trail. Most recently we saw a spinning ring message board. This contest entry is different in that the board is stationary and the print head moves. It’s basically a two-wheeled robot with a laser diode which can swivel perpendicular to the direction of travel. In this way, the laser prints the rows, and the motion of the robot takes care of advancing the columns. 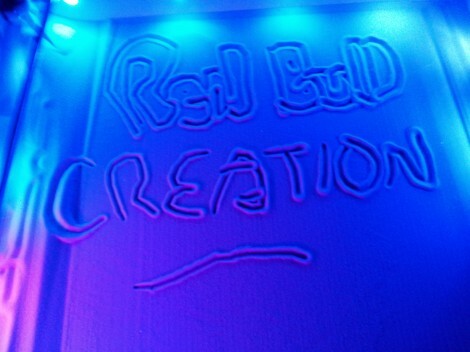 Since laser light has incredible intensity it is able to excite the phosphors much more thoroughly than LEDs. So the message will last longer than that spinning ring project or this awesome turntable hack. Don’t miss the video after the break that shows off the hack along with a bag full of theatrics. The Cool Master is a beer delivery system which Innovation Thirst built as their qualifying entry for this year’s Red Bull Creation contest. It’s one of the best beer delivery concepts we’ve ever seen. Instead of tossing you a beer directly from the fridge, this offering brings the cold beverages directly to you. It even manages to de-cap the bottles before serving. Mobility is provided by a six-wheeled base which allows for a zero-turn radius. 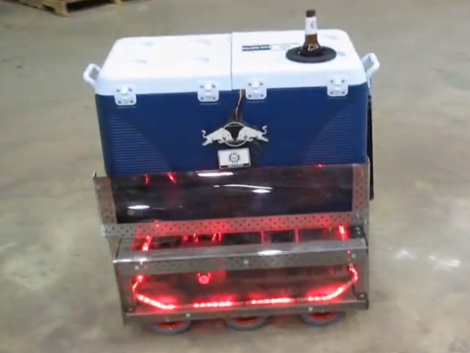 The cooler acts as the body of the robot, and hides a hopper which carries a stock of bottles on their sides. When you want a beer, the bot approaches you, tilts the next bottle to the upright position, removes the cap, then raises the vessel on a beer elevator until it pushes its way through the rubber orifice in the cooler’s lid. Right now the device is operated using an RC controller, but there’s always room for adding autonomy and the ability to restock from a refrigerator. Don’t miss the demo video after the break. Tug of War… with your mind, man! 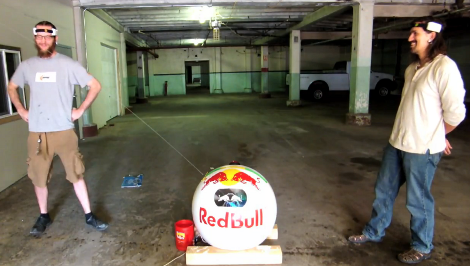 Challenge your friends to a little mental Tug of War thanks to the Omaha Maker Group’s Red Bull Creation contest entry. The power struggle is all in your mind, and can only be won if you’re able to concentrate deeply and quickly. The headsets worn by each competitor monitor brain waves over a ten second window. If you concentrate more deeply than your opponent they’ll get a squirt of water in the face. If no one is concentrating well the contest is a draw the measurements start again. The screenshot above was taken from the test footage found after the break. Hardware details are scant on this one. Obviously the Bullduino is the centerpiece of the build, taking readings from the headsets. A motor moves the water nozzle along a slit cut in the top of the sphere. Progress during the 10-second window is displayed by that nozzle, which starts in the center yellow ‘safe’ zone and moves to one side or another to enter the green ‘kill’ zone. The Harford Hackerspace in Baltimore, Maryland just went public with the zen garden they built for the Red Bull Creation contest. It’s a CNC creation that will help ease your frustration with that DIY 3d printer that you just can’t seem to get calibrated correctly. On the hardware side the base of the machine serves as a sandbox. Finding the correct grain size of the medium was one of the more difficult parts of the build. The stylus is driven along three axes using a gantry common in CNC builds. The pulleys and some brackets were 3d printed, with the remained of the brackets being laser cut from wood. The Bullduino commands the stylus via a stepper motor control board, and drives the LEDs via a bank of MOSFETs. Limiting switches were also included to ensure an error didn’t result in damage to the device. After the break you can see a build montage put to one of the greatest 8-bit game soundtracks of all time. The one thing we wish they would have shown is the built-in leveling bar that is responsible for “erasing” the garden. Update: The Harford Hackerspace members came through with a new video that shows the ‘erasing’ process. You’ll find it after the break. 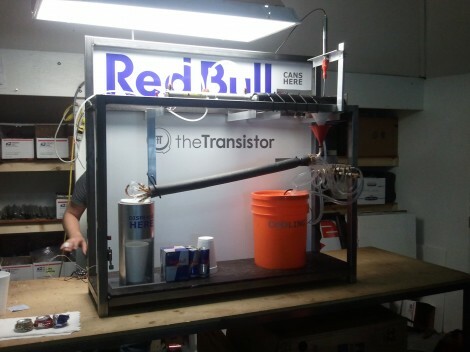 Members of theTransistor, a Provo, Utah based Hackerspace, are showing off their entry in the Red Bull Creation contest. This is an all-in-one energy drink delivery system. It can take a warm can of Red Bull from a reserve rack and turn it into a chilled cup of goodness in no time. And it (kind of) cleans up after itself too! The process starts when a can is opened by lancing it through the side walls. At the upper right corner of the rig you can see the apparatus that is responsible for this beverage extraction technique. The drink drains from the newly created openings into a funnel below. It then enters a heat exchanger the team built by surrounding an aluminum pipe with several copper pipes. The copper has ice water circulating through them from the orange bucket that serves as the reservoir. By the time the drink gets to the cup on the bottom left it is ready to drink. The empty can is crush, falling into a bin and making space for the next in the 16-can backup supply. As the Red Bull Creation Contest gets underway, we’re seeing a ton of great entries, including this one put together by [Team Instructables]. While we are pretty partial to our own spectacular Red Bull Cannon, it’s hard to deny that there is some stiff competition out there. Instructables’ “Romance Pants” are a creation that would undoubtedly fit perfectly as a prop piece for any of the Naked Gun movies. The basic premise behind the pants is that when unzipped, the Bullduino belt buckle wirelessly signals the lights in the room to dim, the music to turn up, and candles to light – setting the mood for romance. Some might argue that anyone wearing a Red Bull-themed Arduino as a belt buckle would have a snowball’s chance in hell of encountering a potential mate – We can’t really argue with you there. That said, their concept is pretty amusing. Stick around to see the Romance Pants in action, as well as a behind the scenes look at how they work.